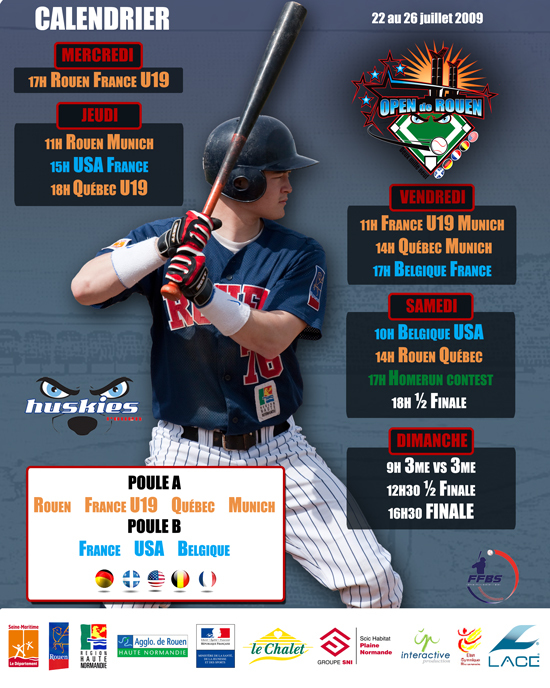 Seven teams will meet from Wednesday, July 22 to Sunday, July 26 at the ballpark of the reigning French champion Huskies to battle for the trophy at the Open de Rouen. Besides host Rouen, the national teams from France and Belgium are also on hand, as well as the Under-19 squad from France, the German club Gauting Indians (with a little help from several Bundesliga Americans), and teams from Quebec and USA (College players). For the rosters of the seven teams take a look at the latest issue of the Huskies mag, starting at page eleven.